I have been a 'Rocky' fan since I can remember. As a little kid I just saw them as thrilling boxing movies with super scary villains like Clubber Lang and Ivan Drago. As I grew older I saw them as films of passion, determination, courage and above all, heart. The 'Rocky' franchise, is more than just six films about an underdog boxer who came from nothing, this is a legacy. Stallone fought hard for his creation to be on the big screen, and he fought harder to not only write and star in these films, but he also fought to keep each film relevant to the time they were in. Stallone has passed the reigns onto director Ryan Coogler, so can this man undertake a huge task of re-imagining an old franchise for the new generation? Let's take a look at it. It's no secret that Adonis Johnson is Apollo's son as a result of an extramarital affair. Adonis grows quite bitter in regards to his famous father, and wants to branch out into boxing on his own terms with a different name. From just knowing that, you can already feel the tension brewing inside of Adonis because he already feels he has enough to prove just by going into the ring, so you can imagine the heights he would have to reach if people knew he was Apollo's son; unfortunately his real name doesn't stay secret for long. 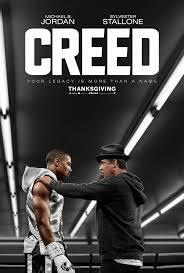 Adonis approaches his father's famous adversary Rocky Balboa in the hopes he will train him. At first you see Rocky doesn't want to do this, but deep down he feels it's his obligation to steer him in the right direction. In the midst of all of the training and emotional weight that Adonis is carrying, he manages to find a little love, with his very sweet yet streetwise neighbour, Bianca. Seem's like despite a few things, it seems to be all going well, that soon changes. Rocky becomes very ill and you can see he just doesn't want to fight any more. He has been fighting his whole life, he fought the streets, getting Mickey to train him, the emotional and physical toll for losing Mickey, Apollo, Adrian and now Paulie, as well as the respect from his own son. But Adonis convinces him to keep on fighting, and side by side they keep on fighting together. And despite all of the emotional baggage that is coming with everything Adonis still keeps his focus on training for his title shot against world champion 'Pretty' Ricky Conlan. Michael B. Jordan's performance was beyond anything I expected. I enjoyed watching the duality of his character, because even though he's very straight laced and a lot more humble than his father, you can see Apollo's determination to get what he wants but through Adonis; that was so lovely to see. His portrayal of Adonis showed a lot of heart, and it was brilliant seeing so much of that being brought up to the surface especially for such a newcomer in the acting biz. This thought alone, got me thinking if Michael. B Jordan can portray such vulnerability at this stage in his acting career through the first installment of what could be a 'Creed' franchise, then who knows what else he could bring to the table in his future career. Sylvester Stallone knocks it out of the park once again with his portrayal of Philadelphia's favourite son, Rocky Balboa. Whenever I watch Stallone as Rocky, it is so evident that this character really is his second skin, and his portrayal in 'Creed' was no exception. We see Rocky later in his life, he no longer has Paulie, his son has moved to Canada, and all he has is his restaurant and his daily visits to sit and talk to Paulie and Adrian in the local cemetery. For the first time since 'Rocky III' we see Rocky wanting to give it up, but this time it isn't his career, instead it's his life. As soon as I saw Rocky feeling so weak, all the memories started flooding back from the previous films; I was a blubbering mess. Even though I was crying like a big girl, I managed to wipe away those tears with my damp sleeve of my jacket, and fire up over the brutal fight scenes. In all my years of watching action and martial art films, I will say that the punches thrown in 'Creed' were some of the most painful looking punches I have seen ever being showed on screen. With each punch thrown, I could hear the film audience wince, and that was exactly what I wanted to hear. There aren't enough words that can convey the fight scenes, other than they will make your body erupt. 'Creed' was a film that I was certain I was going to love, and I knew I would be sitting there crying for a lot of the film, but there was a part of me which was cautious. I just didn't want my favourite on-screen character of all time not get the right treatment, as this was going to be directed and written by someone new. But Ryan Coogler exceeded my expectations, he brought everything which was necessary to make this film truly wonderful. I sat there majority of the film crying, I was so overcome with emotion, and in so much disbelief that I was so lucky to witness such tender moments on film. 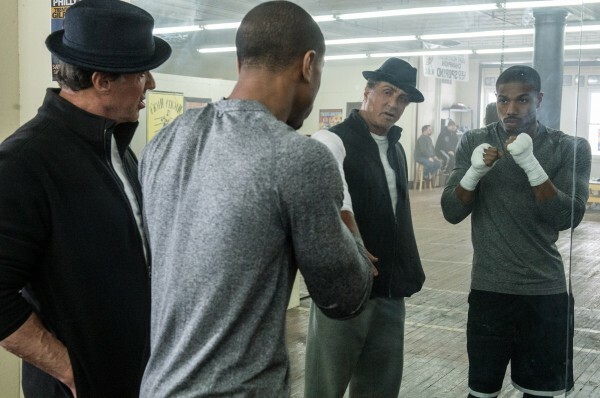 'Creed' possesses a lot of the same raw emotion and aura of the first two 'Rocky' films, this was something I thought I would never see again. For the fans of the 'Rocky' franchise you won't be disappointed, because sure it does cater to the generation however, it has a lot of nods to the older films, which will make you smile and may even make you cry. And for anyone asking, YES THERE IS A MONTAGE!!! I feel the montage is very different, but again has the classic elements which make a work-out montage epic, oh and trust me this one is epic. Watching 'Creed' was seeing everything that Rocky had previously experienced and endured come full circle and now it lives through Adonis. Rocky has fought, lived, loved, and lost, and the fans of his legacy have seen him go through that since 'Rocky' was first released in 1976. As lovers of the film and most of all Stallone's character creation, it's as if we have felt everything Rocky has endured. We have seen him when he felt like he was nothing, and that he couldn't achieve anything great, to becoming a champion. But it isn't just about that lovely gold belt around his waist that makes him a champion. He trained hard, not just physically but emotionally, mentally and psychologically. He found passion and love with Adrian, who always supported him and always kept him grounded no matter how tough the circumstances were. He had the courage to make that leap even though the odds were against him and there would be a big chance that he would fail. And most of all he had the heart to keep going, to keep fighting, to keep loving, despite everyone around him leaving. That is why he is a champion.